Ever since Dr. James Naismith first dreamt up a game that required players to throw a ball into a basket, Americans – and increasingly the world – have been obsessed with the game of basketball. Ever since Tiger Woods won the Masters Golf tournament by 12 strokes at the tender age of 21 the world has been obsessed with golf. It therefore stands to reason that Bucketball may well be the next global sensation. Combining elements of basketball and golf, you goal is to get the ball in the bucket. A subtle concept to be sure. The game starts off innocently enough, a simple toss to a low lying bucket. 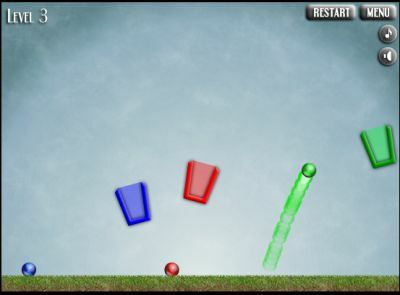 Gameplay is easy to figure out – the colored ball goes in the correspondingly colored bucket and you launch by holding your mouse over the ball and left-click to charge the throw. But like golf, the hole locations can get tricky, and like basketball you’d better not put the ball in the wrong basket. Otherwise you’ll find your shot being forcefully rejected a la Dikembe Mutumbo (you’ll just have to imagine the insouciant finger wagging). There’s not much more to it than that folks. A snarky observer comments that I’ve been on a “real ball kick” lately. So it goes, but we here at the blog hope this offering entertains, enlightens and amuses if only for a brief while. Now get to playing! Thanks to Jay is Games for the find! hmm…i wouldn’t be related to that snarky observer, would i? *$&%!!!**@##*!! you, Conan! This is maddening! I find the first half to be really fun and delightful. You are able to develop skill and employ that skill in each slightly more difficult level, challenging yourself greatly by level 15 or so. By the end of the game (19 and 20) the play is ridiculuosly difficult in the seeming luck it takes to master each stage of the level, and the starting over from scratch so frustrating and time consuming, that the game loses all appeal for me. By the time I beat 19, I gave 20 a couple tries, knowing what needed to be done, but gave up out of exhaustion and disinterest. That’s a shame, because the first 2/3 of the game is really quite nice. Bucketball will plague my dreams, for sure….